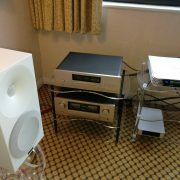 Auden Distribution had a demo room at the recent Bristol Hifi Show. Music Works and Amphion were the focus of the system, and powered by Accuphase electronics the Argon 3S sounded fabulous. Music Works provided P-ReVue table, Reflex mains block, Music Works power cables, and PEEK isolation. Interconnects and loudspeaker cables were from Audiomica Laboratory. The sound was absolutely fabulous and showed what can be done in a hotel room, no need for the “it’s the room” excuse.